Keith Farmer on the Tyco BMW Superstock machine at Cadwell Park this season. Keith Farmer believes he is much better equipped to grasp his opportunity in the Bennetts British Superbike Championship in 2019 after signing with Northern Ireland’s Tyco BMW team. Farmer won the National Superstock 1000 title this year for the TAS Racing outfit, sealing back-to-back British crowns after he clinched the Supersport championship for the first time in 2017. Clogher man Keith Farmer won the National Superstock 1000 Championship for his fourth British crown in 2018. The Clogher man is now a four-time champion, having also won the Superstock 600 and 1000 titles in 2011 and 2012 respectively. With the benefit of that invaluable championship knowhow on his side and the wisdom that comes with a few extra years under his belt, Farmer is confident he can make the most of his sought-after return to BSB. The 31-year-old did not progress as he had hoped when he made his debut in the class with Paul Bird’s Rapid Solicitors Kawasaki team alongside Shane Byrne in 2013, but Farmer says he will adopt a much different approach next season, when he teams up with Christian Iddon to ride the all-new BMW S1000RR. “I’m really excited to be fair and after my first time in British Superbikes, I showed that I had lots of speed, but I didn’t have the experience behind me and we had a few crashes,” he told the News Letter. 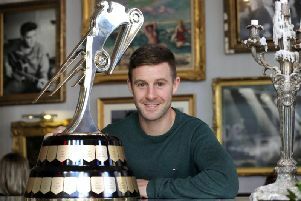 “But after four championships and another two back-to-back titles, I’m not going into British Superbikes with the same attitude I had the last time and I’ll be a bit more calm about the situation. With Philip [Neill] and the team being so grounded, that will help massively as well and I’m really looking forward to it. “With the new BMW S1000RR, there will be a big push on next year to try and get back into the Showdown at least. I’m looking at myself as the second rider in the team because Christian is going into in his fourth year on a BMW I think and in a sense, he has more to prove than I do because he’s been on the bike for so long,” he added. Farmer has retained his crew chief, Phil McLaughlin, for 2019, whom he credits with ‘steering me in a good direction’ with the BMW Superstock machine this year. “It’s going to be difficult, don’t get me wrong, but with the drive everyone has with this new BMW in the team and for me, I’m getting to keep my crew chief from this year – Phil McLaughlin – so I’m really pleased with that. Phil steered me in a good direction this year in terms of riding a 1000cc bike, which was a big positive for me,” Farmer said. 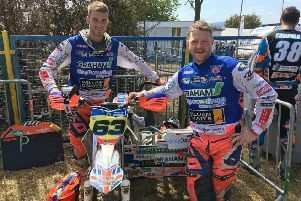 “We actually used to race motocross together when we were a bit younger and we get on together quite well, so I’m really looking forward to getting going. “I don’t see why we shouldn’t be top ten at the start of the season and then hopefully we’ll be chipping away at the top six. Farmer revealed he might have the chance to complete some early testing in Spain over the next few weeks before the winter ban kicks in from January 1. He said: “Philip had mentioned the possibility of getting out for a run in the middle part of December in Spain, so hopefully we’ll have a little spin out in the next couple of weeks. “It wouldn’t be so much as a full race bike, but it would give us a bit of a feeling over what the new bike is like and maybe what’s needed from it. The opening round of the 2019 Bennetts British Superbike Championship will be held at Silverstone from April 19-21.